Announcement Thank you for visiting Oh Fer Cute! Below are the current processing times. If you have any questions please don't hesitate to send a message! Thank you for visiting Oh Fer Cute! Below are the current processing times. This is my 2nd purchase. Beautiful cup arrived just as I requested. This picture does not do this glitter justice. It is awesome! It was a busy day for orders today! I've always been into "crafts" as my family put it growing up. However, I never thought I'd be here today doing what I love for work! I went to school to be a Chiropractor and practiced for about a year before I had my first baby. I then decided that I wanted to stay at home with my kids (I'm up to 2 now), but still felt I needed something else to do if I wasn't working. I dabbled in vinyl cutting and eventually decided to jump onto Etsy. Not knowing if this was going to be a side project or a small business, I trucked ahead. Turns out, I would have a ton of support and my little hobby would turn into a business! Here I am, 2 years later, with a lot of changes and evolution in the process. 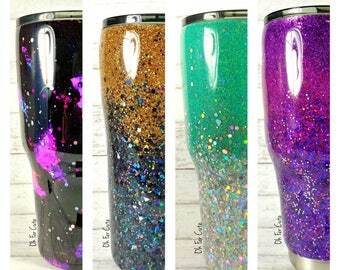 I discovered how much I LOVE glitter, and have focused on creating glittered tumblers. I work and live in a glitter heaven. And my two boys are often sporting glitter in their hair, feet, and sometimes diapers. I am still in awe that I am able to create things and do what I love while still being able to be at home with my kids. I am truly humbled by the support I get from friends, family, and all of my customers. It may be a hectic, busy, and messy process but I enjoy every minute of it. I will gladly work with you to create a custom order if I do not already offer the options. Simply send me a message to inquire! Do not scrub the vinyl. Keep out of extreme heat, such as a car on extremely hot days (vinyl adhesive can melt).